The second March recipe for the Tuesdays with Dorie group is Irish soda bread, chosen just in time for St. Paddy's Day. But March 17 came and went around here, and there were multiple grocery shopping trips after which I realized that I'd forgotten the buttermilk yet again, and I decided to pass on this one. The one and only time I made Irish soda bread was also the one and only time I'd ever tasted it, and I was not a fan. I think most of it ended up in the garbage. But...when the first several posts started popping up this morning, everyone talked about how incredibly quick this recipe was, so I decided that if I was going to skip a recipe, this would probably be a pretty silly one to choose. The little girl and I stopped at the grocery store on the way home and picked up some buttermilk, and we were on our way. This truly was the easiest recipe ever: flour, salt, baking soda, and buttermilk, all stirred and kneaded and formed into a round. That's it. I made a half recipe, and decided at the last minute to go the traditional route and not use any of the extra add-ins. My little boule baked for 35 minutes (thanks, Nancy!) until it reached an internal temperature of 180º. The bread smelled amazing, and we didn't wait long to cut into it. Surprise, surprise, we loved it! How could four simple ingredients bake up into something so tasty? It was delicious as a pre-dinner snack with a little butter, and yummy (even if a little incongruous) with our dinner of chicken-sausage gumbo. 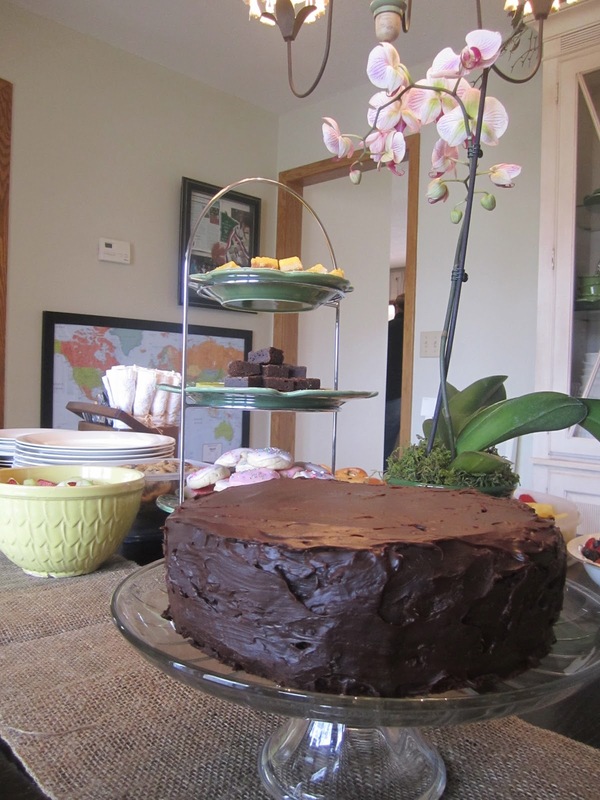 Please check out our hosts' blogs for the recipe (and to see their creative variations): Cathy of My Culinary Mission and Carla of Chocolate Moosey, and check out here to see the other TWDers' creations! It may not look as good, but the leftovers of this are just as delicious! February and March are birthday-ful around here. All of the grandmas (my mom, my mother-in-law, and my stepmom) have birthdays within a few weeks of each other, and this year, we had a birthday dinner for one grandma on Saturday night and Nana's birthday brunch on Sunday morning. All of the grandmas love cheesecake and my stepmom, in particular, has a new fascination with limoncello. 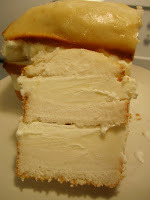 So when Natashya posted this recipe for limoncello cheesecake squares a couple of months ago, this year's birthday treat was a no-brainer; and since we were celebrating two birthdays in one weekend, I was able to make one pan of treats for both. 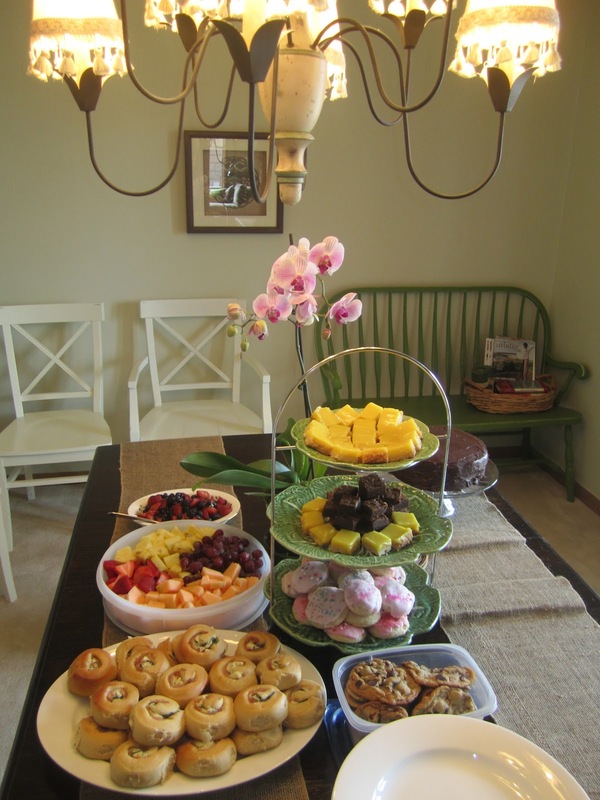 But I knew that, while this was a perfect grandma birthday treat, it would not be appealing or appropriate for the little ones, so I set out to find a fun and delicious birthday party treat for them. When my little guy turned five a few weeks ago, we got a bakery cake for the first time ever (eek! provided by the place where we had his party). But I wanted to make a little something for home, too. 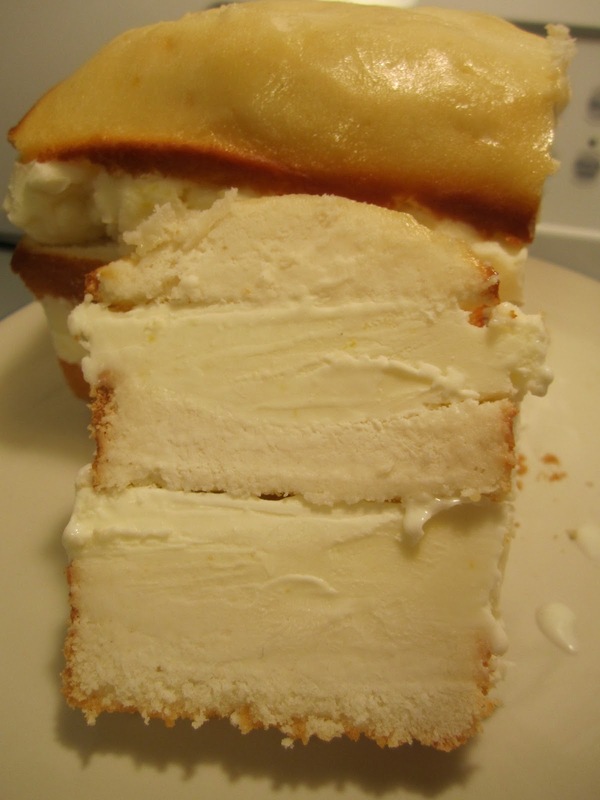 I had the idea of an ice cream cake, so I baked up a quarter-version of Dorie's perfect birthday cake in a mini-loaf pan, made a batch of lemon frozen yogurt, and layered the two together. And then I realized that the lemon curd I'd used in the frozen yogurt was way past it's prime, and I ended up having to throw it all away. It was very depressing. And I also realized that an ice cream cake should use a cake and ice cream with contrasting colors. And then I re-stumbled upon this post from my friend Di for individual ice cream cakes, and I was sold. For my version, I made a batch of peppermint ice cream. I used Jeni's vanilla ice cream recipe, but skipped the vanilla bean, and stirred in a teaspoon each of vanilla extract and peppermint extract at the end. After churning, I spread the ice cream on a half-sheet pan covered in parchment paper and set it in the deep freeze. Then I made (as recommended by Di), Dorie's devil's food cake recipe from BFMYTY. I made a half-recipe, and somehow misread Di's instructions: she used a 9x13 pan, but I mistakenly thought she'd used a half-sheet pan. I thought the batter looked too thin when I spread it out, but I baked it anyway (it took about 15 minutes). This turned out to be a really happy mistake! It made a nice, thin cookie/cake layer that looked just like a real ice cream sandwich, and I thought the cake was in perfect proportion to the ice cream. Once the cake was cool in its pan, I added it to the deep freeze. When it was time for assembly, I used a 2" biscuit cutter dipped in a bowl of hot water to cut out the cake circles and the ice cream circles. Then I used my mini heart cutter to make baby ice cream sandwiches out of the leftover pieces for the family to sample (since by that point, they were all sitting at the counter watching me and saying, "When can we eat these?!"). I stuck the assembled sandwiches back into the deep freeze. Finally, I made a 1/2 batch of Jeni's chocolate bombe shell, and used that to coat the cold sandwiches. I scattered some sprinkles on top, and once more into the deep freeze until the party. There were a lot of little steps, and this recipe definitely takes some serious planning to put together, but nothing was too difficult and the results were sooooo worth it! These little sandwiches were a huge hit with the kids and adults alike: they were so delicious and so fun to eat. They definitely go into my top five desserts I've ever made. I foresee many different variations in our future, although the peppermint-chocolate combination will be repeated as well! Pucker up! It's another virtual blog party, this one hosted by my friend Di with the spring theme of Citrus Sunday. 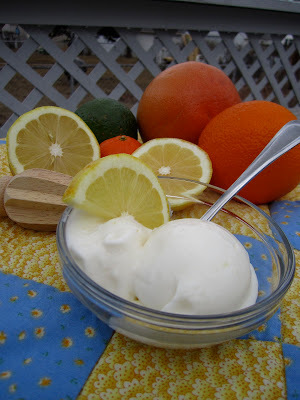 Ever since I first made the amazingly-easy instant lemon curd posted by KAF, I really wanted to make lemon curd ice cream, which we enjoyed multiple times last summer. But I also had a carton of plain yogurt in the fridge, so I began searching my ice cream books for a lemon frozen yogurt recipe. I found one in Jeni's book: she uses a lemon syrup for hers; I subbed in a tiny batch of instant lemon curd instead. The result is an incredibly thick and creamy frozen yogurt with a prominent lemon flavor, definitely a new favorite here. This recipe uses both cream and milk with the yogurt, so it's much richer than our usual frozen yogurt which only includes strawberries and yogurt (and therefore probably not quite as healthy). :) But oh man, is it lemony-delicious!!! 1. For the lemon curd, whisk the egg and sugar together in a medium microwave-safe bowl. Whisk in the melted butter and then the lemon juice and zest. Microwave on high in one-minute increments, stirring well after each minute, until the lemon curd is slightly mounded and coats the back of a spoon (it takes 3 minutes for me). 2. For the frozen yogurt, combine the milk, cream, sugar, corn syrup, and lemon zest in a large saucepan. Bring to a boil over medium-high heat. Boil for four minutes. Turn off heat. 3. In a small bowl, whisk the cornstarch with the 35 g milk. Add cornstarch mixture to the saucepan, and return to boil, stirring constantly with a heat-proof spatula, for one minute. 4. In a large bowl, whisk the cream cheese until smooth. Slowly add the hot milk mixture, whisking vigorously until all of the cream cheese lumps are gone. 5. Whisk in the drained yogurt and the lemon curd. Chill and then proceed according to the directions of your ice cream maker. *To drain the yogurt, Jeni instructs you to use a quart container of plain yogurt. Cover a sieve with a couple layers of cheesecloth and set it in a strainer over a bowl. Pour the yogurt into the sieve, cover with plastic wrap, and let it sit overnight in your fridge. I never plan ahead that well. My process of draining yogurt is a little messier, but much more quick. I dump my yogurt (I used 682 g, about 2/3 of a container) into a clean, white, floursack towel. I wrap it up and squeeze the towel over the sink, which gets rid of all the liquid. Then I open the towel on the counter and scrape out the drained yogurt. **If you don't like the texture of the zest, you can leave it out of the lemon curd and/or strain it out of the ice cream base. ***The second time I made this, I just used all of the mini-batch of lemon curd (about 75 grams); I couldn't tell a difference. Check out Di's post for the other great citrus links! Our first Tuesdays with Dorie recipe for March is rugelach, hosted by Jessica of My Baking Heart and Margaret of The Urban Hiker. My hubby took one bite of the finished product and said, "It's like a cinnamon roll and a danish and a cookie and something else all mixed together, and it's just so good!" I made a half-batch of dough early in the morning. It came together pretty quickly in my stand-mixer: softened butter, softened cream cheese, salt, sugar, and flour. Once it came together into a ball, I patted it into a rectangle and put it in the fridge to chill. Then I made the lekva. We had the choice of prune or apricot lekva. I've never heard of lekva before, but apparently it's a Hungarian fruit butter. I really love prunes, and I'm not a big apricot fan, so this was an easy choice for me. The lekva was incredibly easy to make: prunes boiled in water and combined with sugar, lemon juice, and chopped walnuts. Okay, sounds pretty nothing-special, right? NO! I seriously could've eaten the entire bowl straight-up; it was that good!! Late the same afternoon, I plumped up some dried cherries and chopped up some apricots, toasted some walnuts and pecans, and proceeded with shaping the rugelach. I rolled the dough out into a large rectangle and cut it in half. 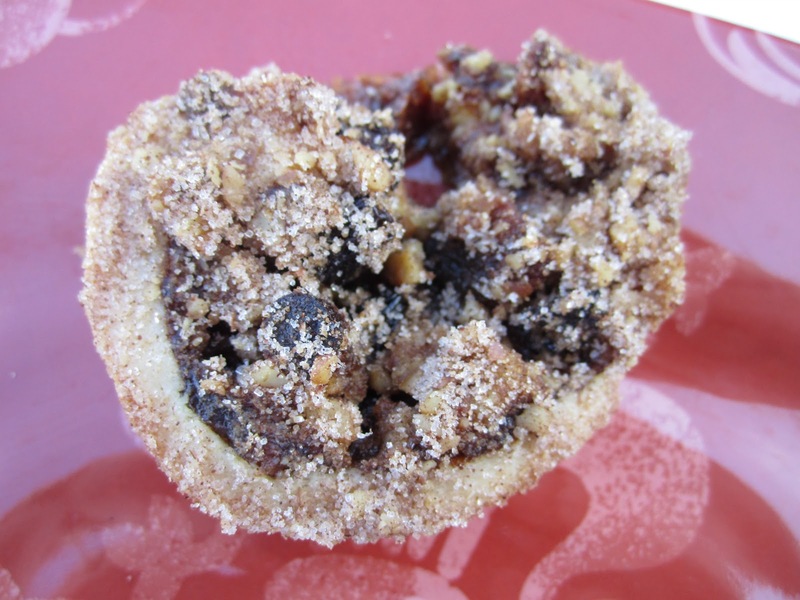 My problems started after I spread it with the lekva and then began to sprinkle on the insane amounts of filling: fruit, nuts, sugar (I also sprinkled in some mini chocolate chips on half, at the kiddos' request). There was no way to roll these babies up! I did the best I could; one strip actually rolled okay. The other one began to tear and there was filling pouring out all over the place. I chilled the rugelach for about six hours, then brushed them with the egg wash, sliced them, dipped them in the sugar-nut mixture, and baked them. Regardless of their looks, these were a big hit with the family! The little girl and I weren't huge fans of the dried fruit, but we all loved the combination of flavors from the prunes, nuts, and dough. 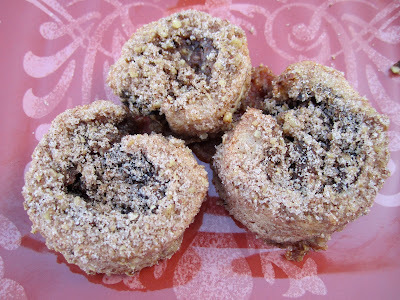 Check out everyone else's rugelach here! Our next chef-of-the-month, chosen by Peggy, was Sunny Anderson. She is another new-to-me chef, but I found many recipes on the Food Network site. I decided to try Sunny's easy BBQ chicken pizza. After sampling the barbecue sauce, which had a bit of a kick, I knew the kiddos wouldn't eat it. I found a bit of extra pizza sauce in the fridge and used it to make 1/3 of a regular pizza with olives and pepperoni for them. 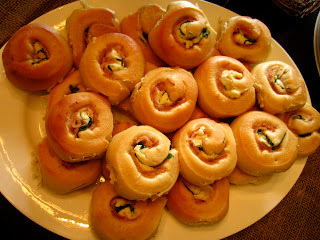 And then, knowing I would have too much bbq chicken, I tried these buffalo chicken rolls that Tracey posted a while ago. I made 2/3 of a barbecue chicken pizza, 8 chicken rolls, and still had another cup of barbecue chicken to freeze for another bbq pizza on a night when we need a quick dinner. I used my normal NM thin-crust pizza recipe, and this awesome new technique from KAF for rolling the pizza out. Have you ever tried to stretch out a pizza crust and had it shrink back? It happens to me all of the time, and it's so frustrating! This time, I oiled the pan as I always do, and then covered the dough with parchment paper and rolled the dough out. As the writers at KAF promised, the parchment prevented the dough from shrinking. Hurray! We really enjoyed this pizza (and the chicken rolls, which were tasty and fun to make!). 1. Preheat oven to 500º. 2. Heat olive oil in a saucepan. Add onion and jalepeno and cook over medium heat for about 6 minutes, or until onions are softened and translucent. 3. Add paprika, cayenne, salt, pepper, and garlic, and cook 1 minute, or until fragrant. 4. Add ketchup, mustard, Worcestershire, brown sugar, and vinegar. Turn heat to medium-high and stir until combined. 6. 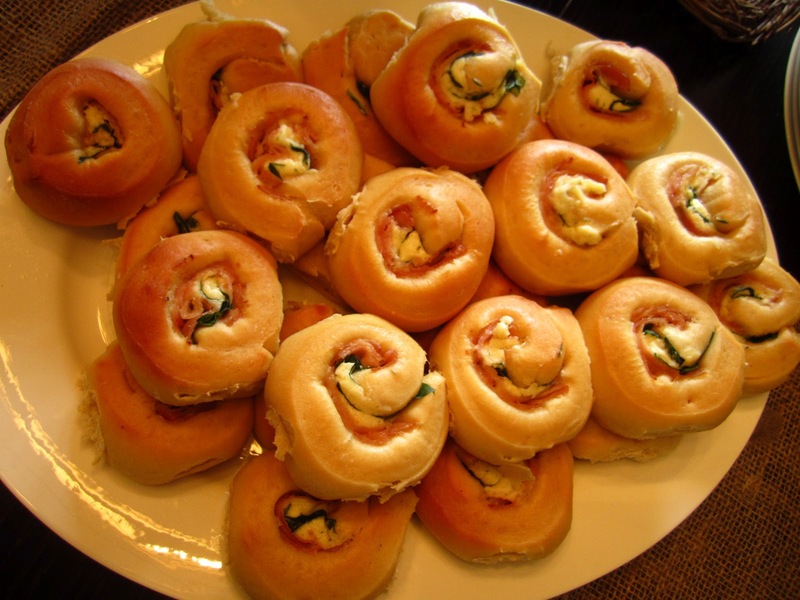 Roll out pizza dough on an oiled jelly roll pan. Cover with chicken. Add cheddar, Parmesan, and mozzarella. Bake for 10 minutes or until crust is baked through and cheese is bubbly and golden. 7. Allow to cool for a few minutes before serving.